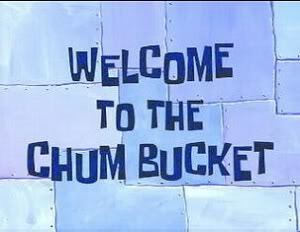 Welcome to the Chum Bucket (Episode) – From SpongePedia, the biggest SpongeBob-wiki in the world! It is closing time at the Krusty Krab, and Mr. Krabs tells SpongeBob that he's going to play a card game. He's going to play against Plankton. SpongeBob is surprised when he hears this, and asks why he'd play against such an evil person. Mr. Krabs explains that Plankton's the worst card-player ever, and he's been winning every week for the last 15 years. In the morning, he tells SpongeBob that he lost, and he bet SpongeBob's contract. SpongeBob is forced to work for Plankton, and Plankton tells him to make a Krabby Patty. SpongeBob doesn't want to, and Plankton 'bribes' him. Soon, SpongeBob's got everything he wanted. He still refuses to make a Krabby Patty. So he takes out his brain and implants it in a Robot SpongeBob. The robot also refuses to make a Krabby Patty. Plankton then begs for Mr. Krabs to take him back, so he pays Mr. Krabs $50 to do so. SpongeBob is back in the Krusty Krab later, and Mr. Krabs tells him to make some Krabby Patties. But he says to ask him later, but Mr. Krabs gets mad and he decides to work double that day for free. If you look closely at the magazine Robot SpongeBob is reading when he starts to rebel against Plankton, it has a SpongeBob comic strip in it, which includes SpongeBob, Patrick, and Squidward. The 4th wall is broken in this episode when Plankton says "I put the brain in the robot, you know." as he was saying it to the viewers. The song "A Stove is a Stove" is a lot like the song "A House Is Not a Home". This page was last modified on 22 August 2010, at 13:02. This page has been accessed 20,960 times.